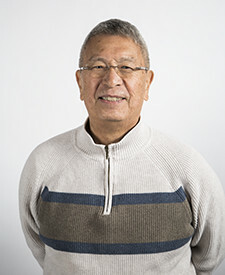 Daniel Lo, 77, was diagnosed in 2010 with multiple myeloma, a relatively rare cancer affecting plasma cells in the bone marrow. The condition was discovered when Daniel was scheduled for open heart surgery to repair blockages found during a routine angiogram. The diagnosis was a surprise since Daniel had none of the symptoms of multiple myeloma, which include fatigue and problems with bruising and bleeding. The heart surgery was canceled and Daniel began chemotherapy, while his family gathered round to lend their support. Daniel and his wife, Colleen, had raised three sons and were looking forward to a move to Edmonds following his retirement after 40 years as a pharmacist in the Tacoma area. "There was a lot going on for us," says Daniel. Rather than open heart surgery, his cardiologist decided to put in stents while Daniel continued his chemotherapy. He and Colleen made the move to Edmonds and for a couple of years, Daniel was relatively stable. But in May 2012, he was diagnosed with congestive heart failure, an inability of the heart to pump adequately. Symptoms include shortness of breath, fluid retention and rapid heartbeat. Daniel's daughter-in-law, who is a nurse, recommended he transfer his cardiac care to Virginia Mason. "It was a good move," says Daniel. He desperately needed open heart surgery, but it was considered too risky because of his ongoing chemotherapy for the multiple myeloma. The Virginia Mason doctor gave Daniel hope that the surgery could be done. In late spring of 2014, Daniel was well enough to go off chemotherapy for two months, a requirement for the surgery to be scheduled. In June, the open heart surgery was done to replace Daniel's mitral and aortic valves. During the hours-long operation, Colleen was surrounded by family and appreciated the Virginia Mason practice of frequent updates on how the surgery was progressing. By the time Daniel was out of recovery and into intensive care, he was "really doing well." He could tell right away, he says, that the surgery was successful because of the way he felt. After seven days in the hospital, Daniel went to a transitional rehab facility and then home. For now, Daniel doesn't need to resume chemotherapy since tests show that he is "stable." There is no cure for multiple myeloma. Today, Daniel goes to the gym regularly to do exercises that keep his heart strong. "And I go for walks just like a normal person," he says with a laugh. He adds that one of the things he appreciates most about his care at Virginia Mason is that the doctors decided to do the surgery at all. "The multiple myeloma made it a big risk," says Daniel, "but because they took that risk, I got my life back."